A full home cinema installation with the Optoma HD28DSE Full HD projector, 7.1 surround sound from Klipsch and Onkyo AV amplifier and Blu-ray Disc Player. Based in Białystok, the largest city in Northeastern Poland, HifiStore offers comprehensive AV solutions including home cinema, stereo systems and turntables, headphones and accessories. 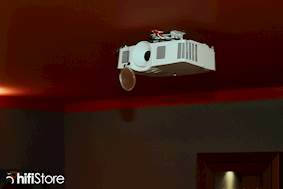 Challenge: A Polish film fan wanted to create a stylish home cinema in his irregularly shaped, low-ceilinged cellar. Solution: Sklep Hifistore installed an Optoma HD28DSE Full HD projector together with a 300cm electric screen Onkyo’s home cinema receiver and Blu-ray Disc Player and Klipsch speakers. A film fan in Białystok, Poland, wanted to create a home cinema and music listening room in his cellar. The room was an irregular shape with a height of just 2.5m. Due to the room limitations, it was important to the customer that the projector had a compact design and was capable of projecting from a relatively short distance from the screen (4.4m). Sklep Hifistore chose the Optoma HD28DSE Full HD projector for the installation. This is engineered with DARBEE Visual Presence image enhancement technology to bring out more detail and depth in skin tones and textures. Weighing just 2.58kg, this small but bright 3,000-lumen 3D ready projector is suitable for use with the lights on giving video games, Blu-ray movies and HDTV programming amazing image clarity. Two HDMI inputs allow the HD28DSE to easily connect to laptops, Blu-ray DVD players, gaming consoles and digital set top boxes. MHL connectivity makes it easy to share content from devices such as the Optoma HDCast Pro, Roku's streaming stick, tablets and smartphones and the HD28DSE’s powered USB output is ideal for powering devices such as Google’s Chromecast and Amazon’s FireTV media dongles. It installed a 300cm electric screen from Polish brand Viz –Art - Venus Plus model CINE together with Onkyo TX- NR545 home cinema receiver and Onkyo BD - SP353 Blu-ray Disc Player with Hi-Res Audio Playback. Klipsch speakers were used for the surround sound with Klipsch R-26F at the front, Klipsch R-25C as a central column, Klipsch R-15M and R-14S for the sides. The subwoofer used in the project is the Klipsch R-112SW, which was located behind the viewing seats. 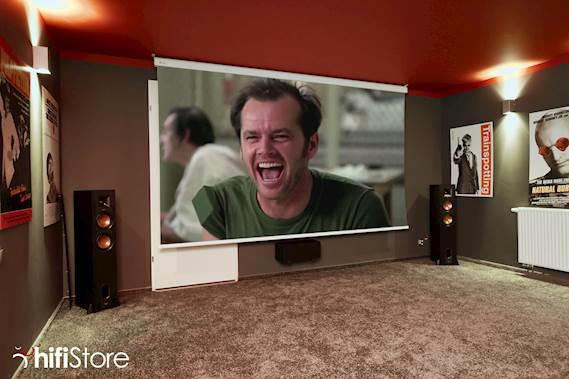 Sklep Hifistore completed the look and feel of the home cinema room with posters of cult films such as Amelie and One Flew Over the Cuckoo's Nest. 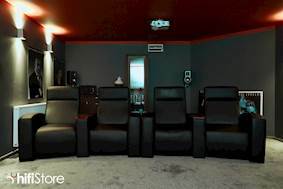 Wojciech Biendzio from Sklep Hifistore said: “The customer is thrilled with his new home cinema room which has a brilliant atmosphere to watch films crowned with advanced equipment to enjoy high-quality HD video and audio. “The Klipsch Reference speakers create a clean, natural sound which fill small to medium sized rooms with powerful, lifelike performances. Optoma HD28DSE Full HD projector, Viz-Art Wenus Plus CINE electric screen, Onkyo TX-NR545 AV amplifier and Onkyo BD-SP353 Blu-ray Disc Player, Klipsch Reference speakers R-26F, R-25C, R-15M, R-14S, R-112SW.